POP! 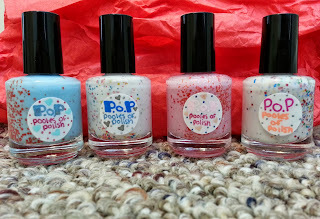 - Pooles Of Polish is hand mixed nail polish by a dear friend of mine, Melissa! I am not the girliest of girls but I do enjoy make up and nail polish. I acutally have a collection of nail polish, which I mainly use for my daughters! Well, I was lucky enough to add 2 more to our collection! First, I have to just say the selection Pooles Of Polish has is awesome and I can’t wait to order some that I have my eye on! 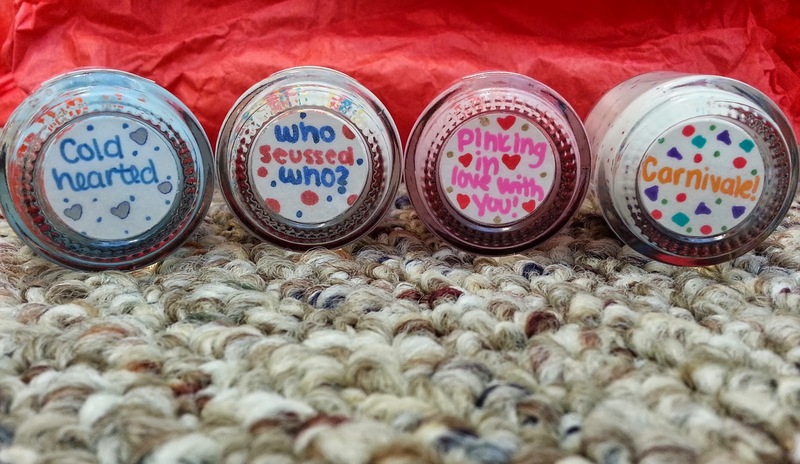 The 4 polishes I received were ‘Cold Hearted’, ‘Who Sussed Who?’, ‘Pinking In Love With You’ and ‘Carnivale!’. I will be giving away 2 of these beautiful polishes! 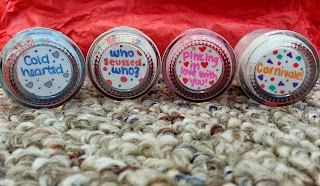 Here is ‘Who Sussed Who?’ and ‘Pinking In Love With You’! I absolutely love both colors but Pinking In Love With You is my favorite! Its a Light pink base with multi sized orange hex glitters, and a hint of silver glitter. Who Sussed Who is a creamy semi opaque, white base, with blue, red and yellow squares, and hexes. It's Lily's new favorite polish!!! Overall I love Pooles Of Polish. She has a great selection to choose from and she is simply amazing at what she does! Melissa has asked me to giveaway ‘Carnivale!’ and ‘Cold Hearted’ to one of my lucky followers! DISCLAIMER: All products received are complimentary for testing purposes from Pooles Of Polish. All opinions stated are my own and are not influenced by any affiliates. I love "Who Seussed Who?". My daughter would LOVE this polish!!! I love nail polish and pretty nails so much. I wish I could getmay nails to stay nice after polishing them. I haven't bought nail polish in soooo long! Thanks for sharing! I like the Cookies N Dream Dream! Going green for your heart"
My daughter and I would love these polishes! We like the "Pumpkins out early"
You KNOW I want that 'Infected" one, haha. Or the coffee one... or the kids mess one. They all speak to me personally, lol. Oh those are so cool. My daughters would go nuts. Going green for your heart definitely caught my eye! I love the Honey I spiked the (pink!) lemonade! The fairy told you so! My favorite is "I didn't do it"
i love the "A cookies n' cream dream"
Yay!!!! Super stoked!! Thank you girls! !